How do you break your own dominating world record in the Ironman triathlon? You cool down and hydrate with a beer shower, of course. Over the weekend Chrissie Wellington bested her own triathlon record with an 8 hour 18 minute race at the Quelle Challenge Roth in Germany. To put that in perspective, she ran a blistering 2:44 marathon final leg, which was just 4 minutes slower than the overall male winner. She was no doubt aided by dousing herself completely with a massive glass of beer after the cycling stage. The hoppy shower was captured as the photo of the day by the London Daily Telegraph. This isn’t her first exposure to massive quantities of beer in at the German (where else?) triathlon. After the British beer runner broke the world record in 2009, she explained the appeal of the Roth in her online journal. But she was unsure if she could break her own record, much less shatter it by a minute this year. Clearly, the beer had to play an integral role, as Wellington alluded. “Pictures tell a thousand words,” Wellington tweeted with the photo after the race. 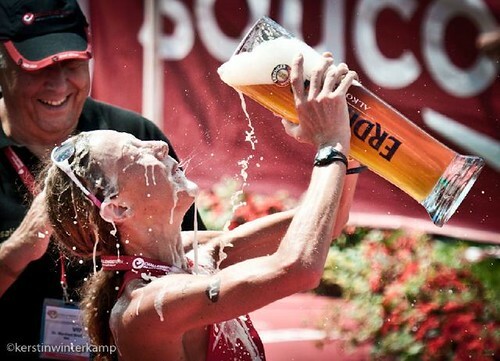 I hope she got a glass just as big at the finish.